Lanes Driving School was set up in 1914 and since then, we have established ourselves as a leading provider of driving lessons. We have many happy pupils who have successfully passed their driving test with us and who have gone on to become well-rounded, confident drivers. We also offer driving theory classes, which can be taken alongside your practical driving lessons, or as a standalone course. To enquire further about taking driving lessons in Thetford, contact Lanes Driving School. One of the reasons why our driving school is so successful is because we treat all our students as individuals. As a learner driver, you will learn at your own pace and have your own strengths and weaknesses. Our driving instructors fully appreciate this, giving you the support you need to develop into a confident driver, ready to pass your test. Flexibility – we work around your busy schedule and book in lessons at times to suit you. Patient instructors – our driving teachers have years of experience and adapt to each and every pupil and learning style. All-round learning – our instructors will tailor the lesson to you, addressing any areas where you need more support. Safe, comfortable cars – we have our own fleet of dual control vehicles, especially adapted for learner drivers. 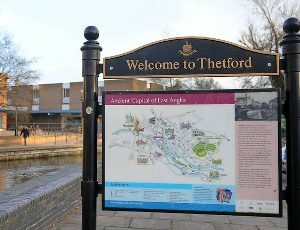 As a small market town, Thetford has plenty of quiet roads nearby which are excellent for learner drivers. We will start your lessons off on roads like these, in areas such as Roundham, where you will be able to practice without any pressure. As you become more confident, you can progress to driving on the A11 and the Elveden Bypass between Elveden, Norwich and Thetford, to give you dual carriageway practice. You can also drive on country roads in and around Thetford Forest – areas like Wrotham and Great Hockham give you the chance to take it slowly or build up some speed depending on your confidence levels. Croxton –practice parking in quiet cul de sacs. Barnham and Euston – improve your spatial awareness driving on narrower streets. Rushford – perfect for learning to drive on country roads. Give our head office a call – we will be happy to talk to you about booking your driving lessons in or around Thetford. Call 020 8166 5678 or send us a message and we will be in touch ASAP.